Bosch 1617EVSPK should be a good addition to the tool collection of intermediate and advanced woodworkers. It can be handheld or mounted on a table to accomplish a number of cutting or routing tasks. With a 12Amp motor, this machine generates enough power that can handle tough routing and cutting tasks. However, it can also be used for work around the house. Given its impressive performance, excellent designs and specifications, features, versatility, and durability, it has been rated high by consumers. But before thinking that this product is all you need, it will be good you find the various features it comes with to see if they will meet your requirements. Here are the features of this product as well as its pros and cons. 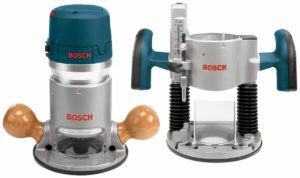 With a 12Amp motor that generates 2.25 horsepower, this Bosch router is capable of handling different kinds of jobs such as hardwood cutting, trimming of edges and others. The motor is safe and well protected from abuse, falls and impact of every day use thanks to its case made from aluminum. Spinning at a variable speed of 8,000 to 25,000 RPM, the router feature variable speed dial for setting the speed to suit the typing task being handled with it. The router is designed to keep to a constant speed during the cut. This is achievable using the router’s constant response circuitry built. The motor does not start with a very high force because the machine comes with a soft-start feature. 1617EVSPK is a versatile router with the kit containing fixed and plunge bases. Thus, whether you want to do a fixed depth routing or a plunge routing, you will be able to accomplish that using this machine. Each of the bases has a microfine bit depth adjustment system which enhances the swiftness and accuracy at which the bit depth adjustments can be accomplished. The bit can be positioned at the center of the optional template guides or the subbase. With this arrangement, it can easily be positioned at the intended cutting-line when guidance devices like templates, dovetail fixtures, and jigs are being utilized. It is also not difficult to change bases as no tool is required to accomplish it thanks to the machine’s clamp system for quick tool-free conversion. 1617EVSPK is comfortable and easy to work with thanks to its handles made from wooden material. Users will not experience any hand fatigue when working with this tool. It is strongly built and it can endure many years of use. It comes with a work light, motor alignment arrows and a whole lot of features that together make working with the tool very easy and efficient. It is versatile as it features both fixed and plunge bases and also has variable speed dial. Besides, it can also use different sizes of the collet which can easily be changed. The unit may be heavy for some people especially when the plunge base is used. The collet does not easily release the bit unless a wrench is used to lose the collet nut. The kit does not come with some accessories that you will require to implement edging guided routing. 1617EVSPK delivers impressive performance. It boasts of ease-of-use and features a motor that can deliver huge power making it great for mid-range and heavy-duty cutting and routing. It can be handheld or use on a table but if you want to use it as a table mounted router, you need to purchase a Bosch router table.